There’s always been issues with what the Liberals and Progressives call Intersectionality, especially as it impact Identity Politics. But, with the rise of the American people and the election of Donald Trump as POTUS, this has reached pathological proportions. Now, much like the LGBTQ –or whatever the alphabet soup is supposed to be today – scene and the various street gangs, one has to properly flag, which can be a specific and advanced project, if one wishes to get past these Liberals’ and Progressives’ gatekeepers. 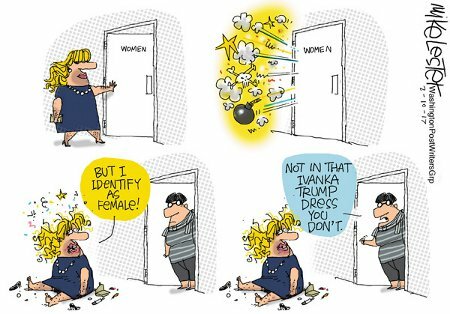 So yeah, some guy in a dress isn’t going to be allowed to identify as a womyn if (s)he’s wearing anything by Ivanka Trump. This entry was posted on Saturday, March 25th, 2017 at 8:00 am and is filed under Politics. You can leave a response, or trackback from your own site.